I don't know about you but the one thing I absolutely hate to do around the house is iron. I HATE to iron. I will do anything to avoid it. In fact, I have to admit that I don't iron unless I absolutely have to. My husband irons his clothes when they need it. I will do anything else to do with the laundry. Laundry is probably my favorite chore around the house, as long as I don't have to iron. So, you can just imagine my excitement when I was given the opportunity to do a review of Downy Wrinkle Releaser Plus. I will jump at any chance to not have to iron. In fact, I think I responded to the email in record time, probably less than a minute. Once we got to the hotel, we tarted to get ready. My husband was like, "you need to iron your clothes before we go." I said, "nope, I'm going to try the Downy Wrinkle Releaser I got." You know anything to avoid ironing. I wasn't very sure it would work very well. Imagine my excitement when I tried it and it worked and I didn't have to iron. Now I can really avoid ironing. I forgot to take pictures in all of my excitement. So, I took some other pictures when I got home. 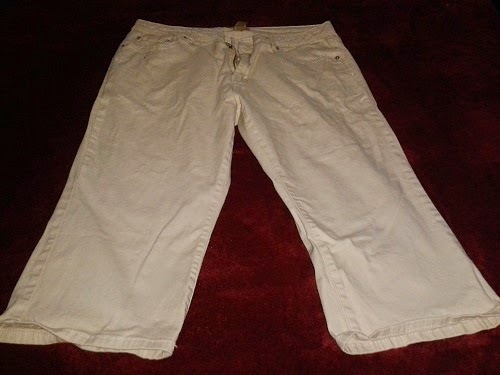 Here is a picture of a pair of pants before. 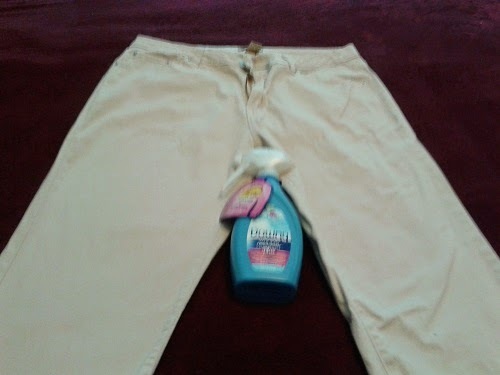 This one is with one pant leg after I used Downy Wrinkle Releaser Plus. This next one is a close up after I used the Downy Wrinkle Releaser Plus. Look, no wrinkles mom. Of course, you can use this with an iron instead of using water or starch. The spray trigger has a new design that produces a finer mist. 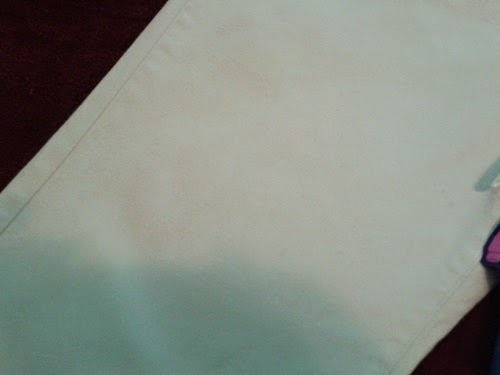 There is no more of those big wet spots or residue that you get with starch. It provides a broader coverage which reduces drying time. What's even better is that it has so many other uses. In fact, the Downy Wrinkle Releaser Plus website has 101 uses for it. You can even use it to remove odors and to freshen up furniture, pet beds, etc. I definitely need it for my pet blankets. I swear I give my dogs a bath at least once a week, and wash their blankets every time I give them bathes, but the blankets still end up smelling after a day or two. You know what is even better, though? 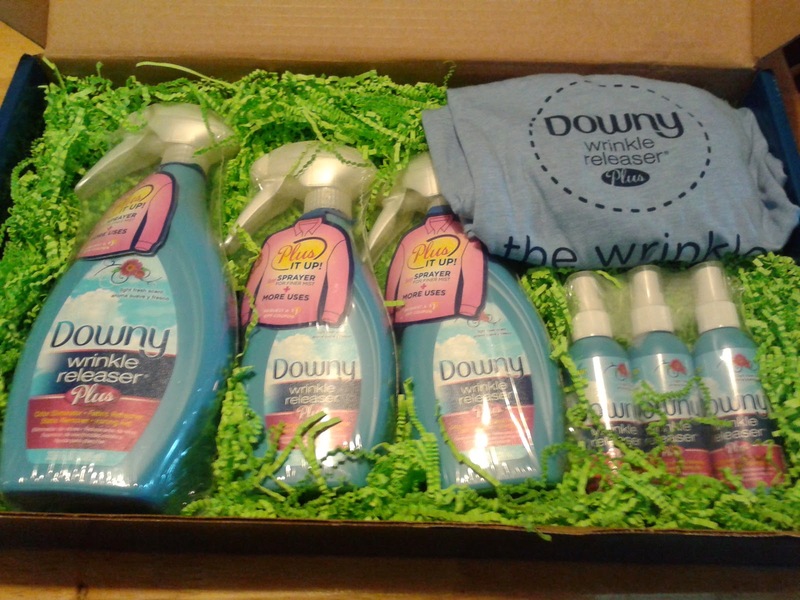 One of my lucky readers will get to win a prize package from Downy Wrinkle Releaser Plus. That's right. The winner will get to check it out for free, too. Even if you don't win, you can get a coupon for $1 off of Downy Wrinkle Releaser Plus. To enter, all you need to do is use the Rafflecopter below. Good luck! !